“Fried food” just sounds unhealthy, but it doesn’t have to be. If you’re using a heart-healthy oil like olive oil, and cooking at a high enough temperature, there’s no reason to be afraid of getting out your skillet. 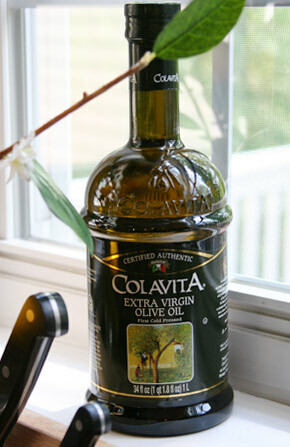 The trick is to use good oil (extra-virgin olive oil is the only choice in my house) and good heat. Don’t skimp on the oil, and be sure to let it get good and hot before adding your meat. At medium-high temperatures, the oil helps seal the moisture in the meat or veggies, especially if you’re frying something breaded. If the oil in your pan is too shallow or not hot enough, breadcrumbs will soak the oil up like a sponge, and you’ll get a soggy, oily crust. And don’t worry about the “smoke point” of olive oil. You won’t get near hot enough on your stovetop unless you’re cooking on the very highest setting, and then you’re going to burn your food, so the sourness from too-hot oil won’t really matter anyway. PS—The technical term for frying at a higher temperature is “sauté,” which means “to jump” in French for the way the food jumps around in the pan. Sounds much healthier and a little fancier, right?